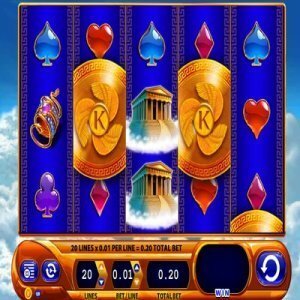 [miau] The Kronos Slot casino game started in regular casinos, based on land. Because of its popularity, it was turned into an online game as well, and it is a WMS G+ Deluxe slots game. This game launched online in September 2012 and is a favorite for many who like slot games. The online version of this game is very similar to the land-based version, making it an easy transition for those who used to play the physical slot machine, featuring this game. The game Kronos has 20 pay lines, and you can win up to 100 free spins while you’re in the bonus feature. While many other games may not include free spins at all, it’s a great feature that this game will give you up to 100. Bright colors, as well as bold ones, are splashed over the background of blue. There are different symbols that you’ll find in this game, including clubs, spades, wilds, Pegasus, hearts, and of course Kronos among others. This game pays from left to right as well as right to left, which is a unique feature of the game. When five of the Kronos symbols appear on reels 1 & 2, or on reels 3 and 4, then you’ll hear noises while the next reel spins; drawing your anticipation. If Kronos symbols appear adjacently on the three reels going across, then you’ll have a winning combination. The music was well chosen for this game, and gives momentum to anyone playing, and makes one anticipate the next spin, especially when the music plays on the free spin bonus. Wilds can be substituted for Kronos as well as other symbols, except for the bonus symbol. There is a total of 20 lines and five reels that’s in this slot game, and the minimum bet is at least $0.20 and you can bet up to $60. The maximum coins that you can play is 20 and the coin bet range is from $0.01 up to $3.00. There is also an auto-play option if the player wants to use it. There are free spin bonuses, and if you get at least three or more of the golden medallions, it triggers the free spin. By getting three bonus symbols, this will give you 10 free spins; four bonus symbols will give you 25 free spins, and five bonus symbols will give you a whopping, 100 free spins. The free spins alone is a great reason to choose this game; it gives you up to 100 additional chances to win on top of your original play. If you’re in the bonus spin, the background will then turn into an orange type, color and wilds are added to the reels, allowing players an opportunity for a bigger win, and a chance to get winning Kronos combinations. Also note that the bonus feature can be re-triggered, and the re-triggering bonus symbols, is what it’s based upon. Even with the possibility to win up to 100 free spins, you may not always win big. Sometimes as little as 10 free spins, will give you as much as you would win from 100 free spins. Either way, this game is highly recommended for those looking for a game with many free chances to win extra cash.